A member of the Speaker Hall of Fame, Steve Gilliland is a prolific author and one of the most in-demand and top-rated speakers in the world. Recognized as a master storyteller and brilliant comedian, he can be heard daily on SiriusXM Radio’s Laugh USA. Steve loves to make people smile and laugh, and there is none better when it comes to sharing funny stories. 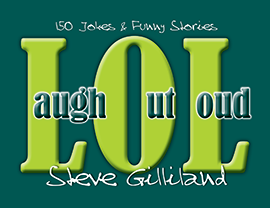 LOL is a collection of over 150 funny jokes, stories and rib-tickling fun!